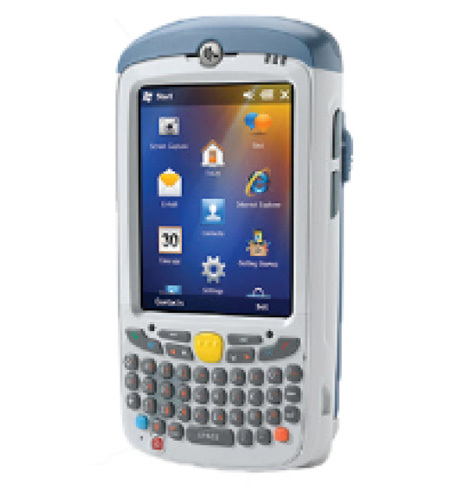 The Zebra Zebra MC55A0 is a high-class portable computer that combines perfect PDA design with optimal performance for demanding commercial applications. It is both compact and light while offering advanced data collection functions, flexible speech and data communication and problem-free integration into wireless networks (Wi-Fi and Bluetooth). A special version with GPS/GPRS for field services and applications is also available. The MC55A0 is the ideal device for applications in retail, field and distribution. Its large TFT LCD touch screen is easy to read at a resolution of 640 x 480 pixels. Users can collect data with either its laser scanner or the 2D imager, which is compatible with a 3.2 megapixel camera. The 2D imager is capable of reading 1D, 2D and even postal codes at a resolution of 752 x 480 pixels. However, the MC55A0 is far more robust than conventional PDAs. Every device component was specially designed with reliability in mind. Its battery management functions are optimised, so daily use is possible without interruptions. The MC55A0 offers superior management features and is quickly integrated into new or existing IT structures. Its Microsoft Windows Mobile 6.5-based platform always guarantees smooth and fast adaption. Customers integrate the MC55A0 into existing networks effortlessly. Using a web-based intuitive remote management interface, it is possible to use a very large number of terminals at the same time. If necessary, you also can extend the memory capacity of the MC55A0 easily to up fabulous to 32 GB with its MicroSD slot. Furthermore, the device is ready for Voice-over-IP speech communication using Push-to-Talk, one-to-one or one-to-many.